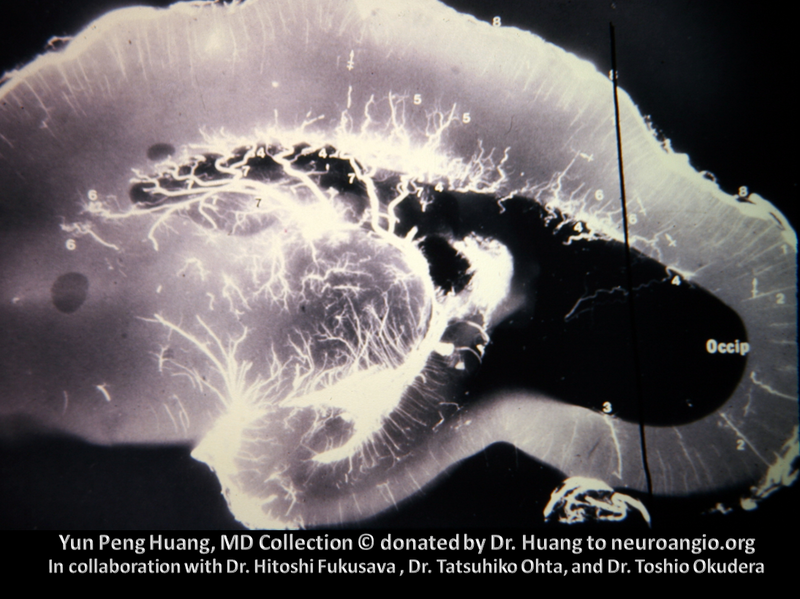 Dr. Huang and colleagues, particularly Dr. Hitoshi Fukusava, Dr. Tatsuhiko Ohta, and Dr. Toshio Okudera carried out seminal research on the topic of cerebral venous architecture. 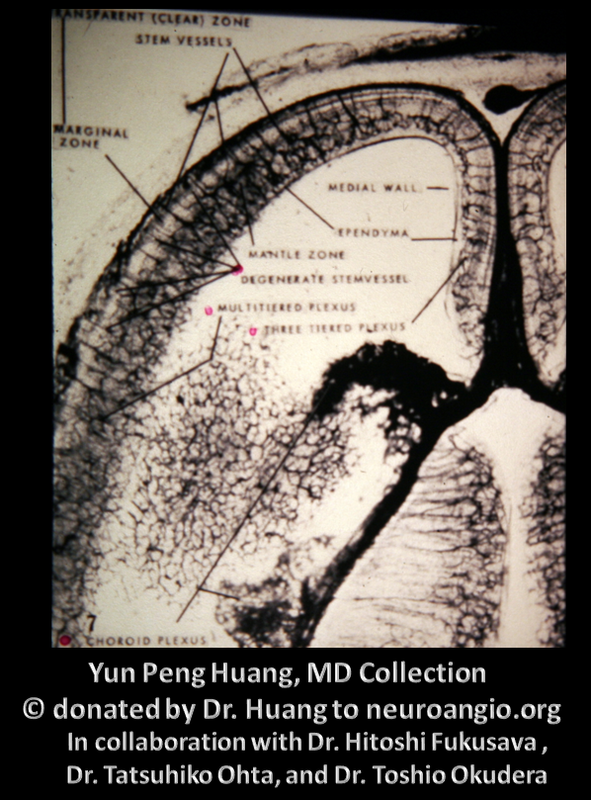 The venous system has historically taken a back seat to its arterial complement. 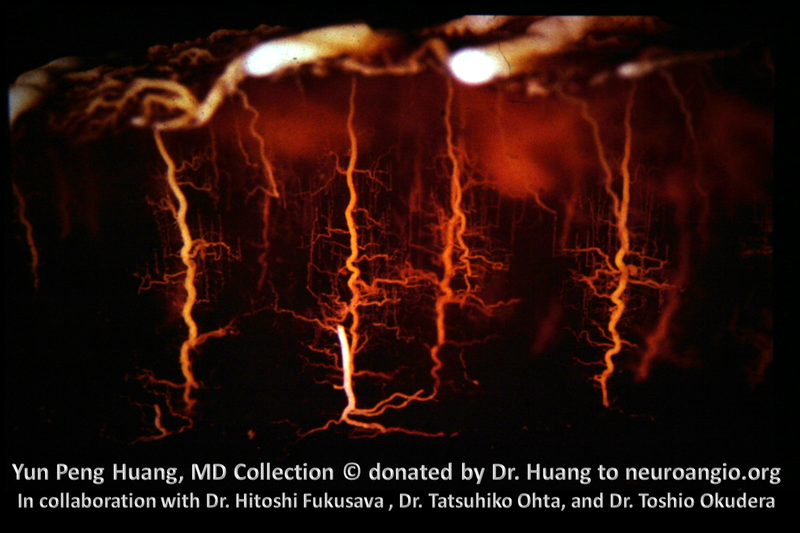 Consequently many conditions which affect the venous system remained, and continue to be, less well understood than those of the arteries. 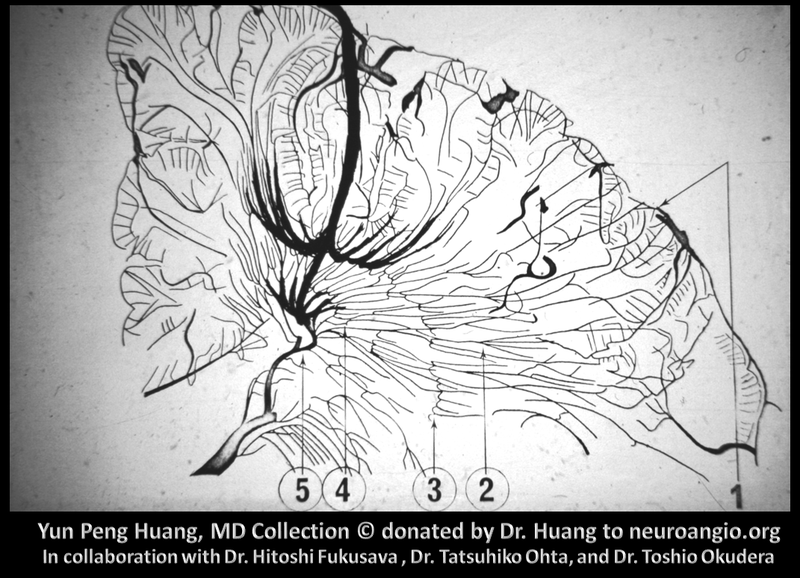 The microarchitecture of the venous drainage was one such area; credit for advancing knowledge here goes to very large extent to Dr. Huang and his collaborators. Our current understanding of the DVA is a result of these insights. 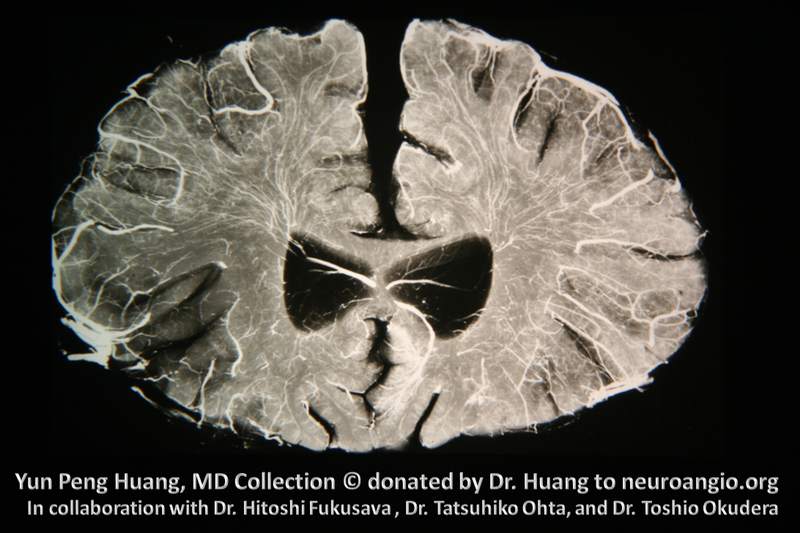 The Medullary venous Malformation, now better known as the Developmental Venous Anomaly, or DVA, is seen in as many as 15% of brains on current generation MR scanners. 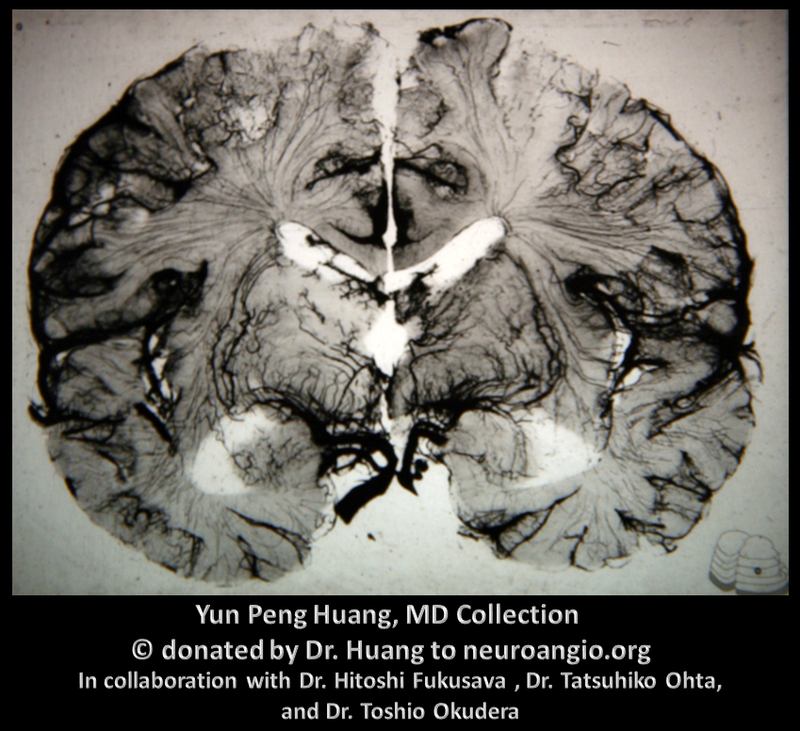 It is a purely venous structure which drains normal brain parenchyma, and an incidental finding in vast majority of cases, with some rare exceptions. There is no consensus on how exactly DVAs form. 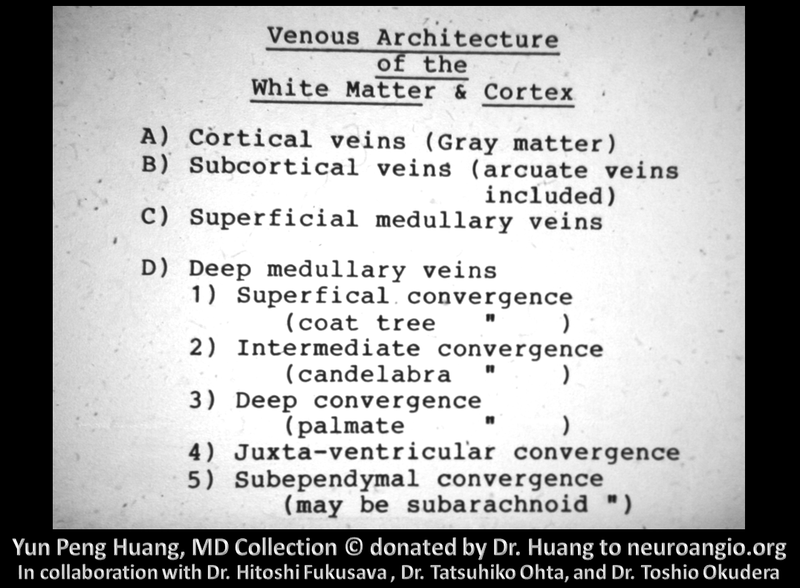 Fundamentally, they seem to be aberrations in the “normal” balance between superficial and deep venous drainage systems, particularly involving the territory of the deep white matter. 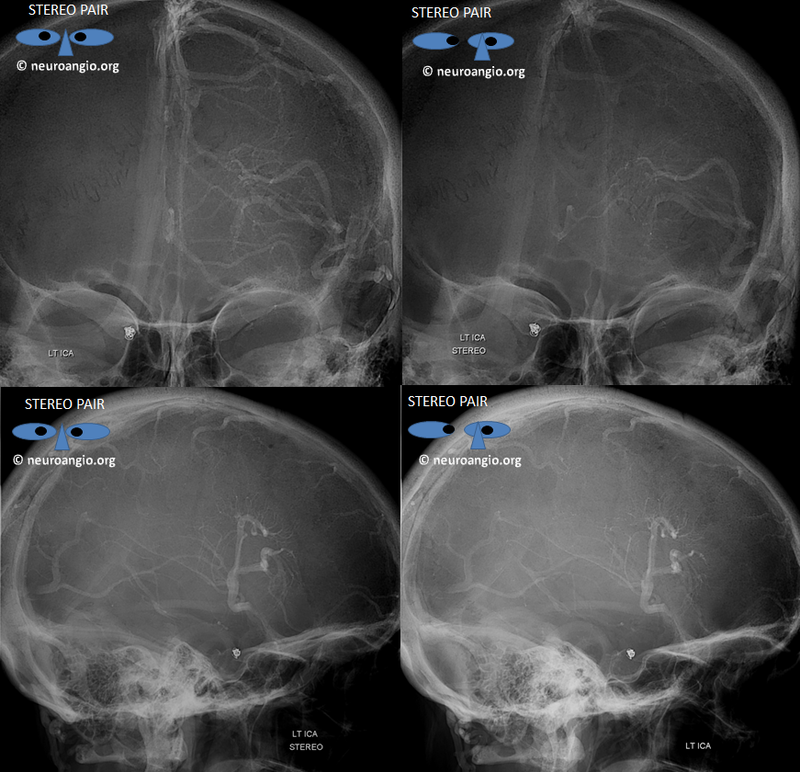 The superficial drainage apparatus consists of the extraparenchymal pial veins, cortical (subpial) veins, and superficial medullary veins located just underneath the cortex. 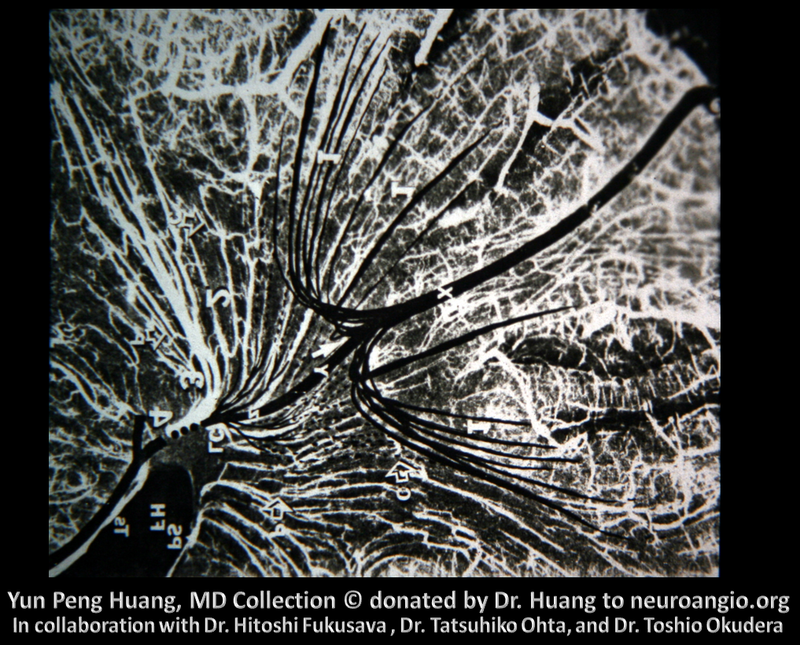 The deep system includes subependymal veins and deep medullary veins which drain the bulk of white matter. 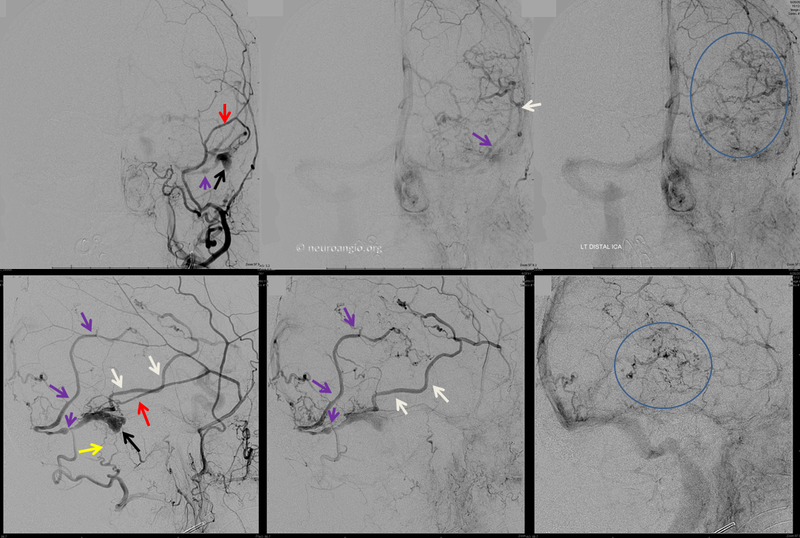 Some anastomotic venous channels, known as transmedullary veins, traverse the entire distance between pial and ependymal veins. 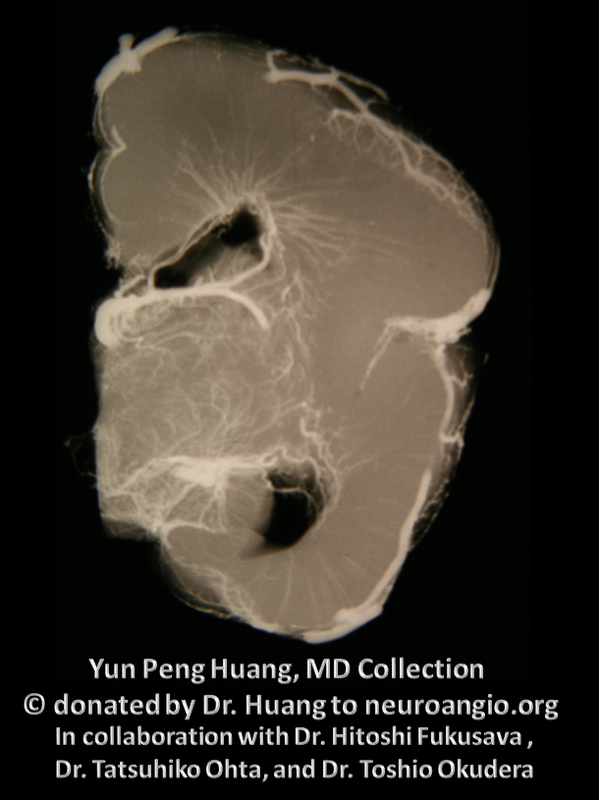 They appear to be more common in the embryonic stages, and their density seems to decrease with increasing thickness of the hemispheric parenchyma. 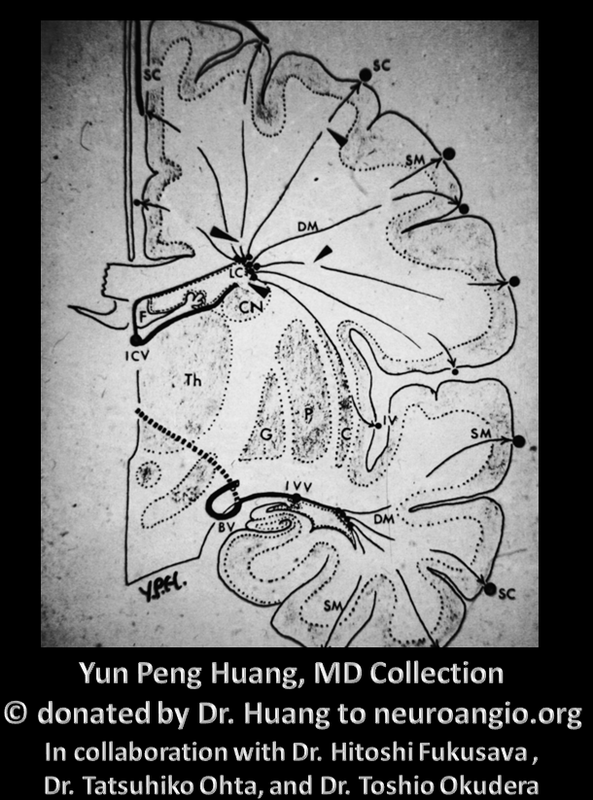 The superficial and deep medullary territories represent, if you will, the watershed zone between the pial and ependymal collectors. When the balance of drainage is shifted towards either one, the vein or veins collecting the larger than “normal” territory is enlarged. 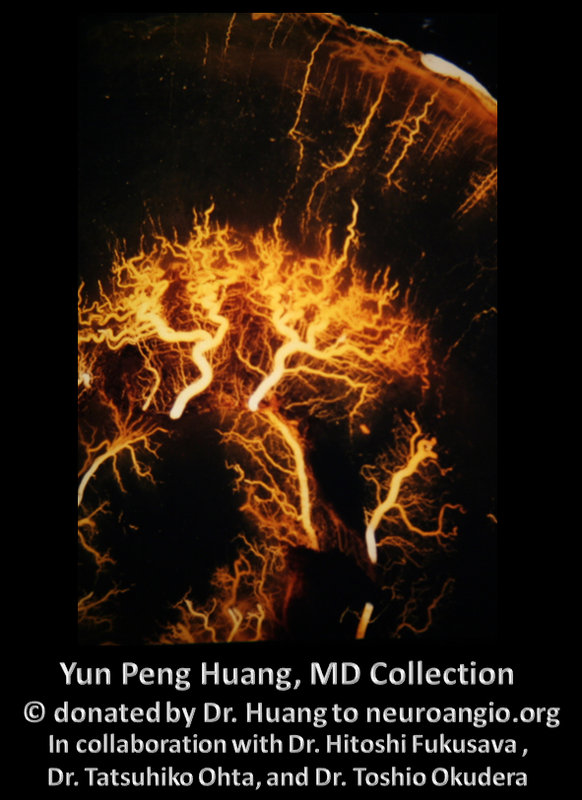 This venous collector is the Medullary Venous Malformation of Y.P. 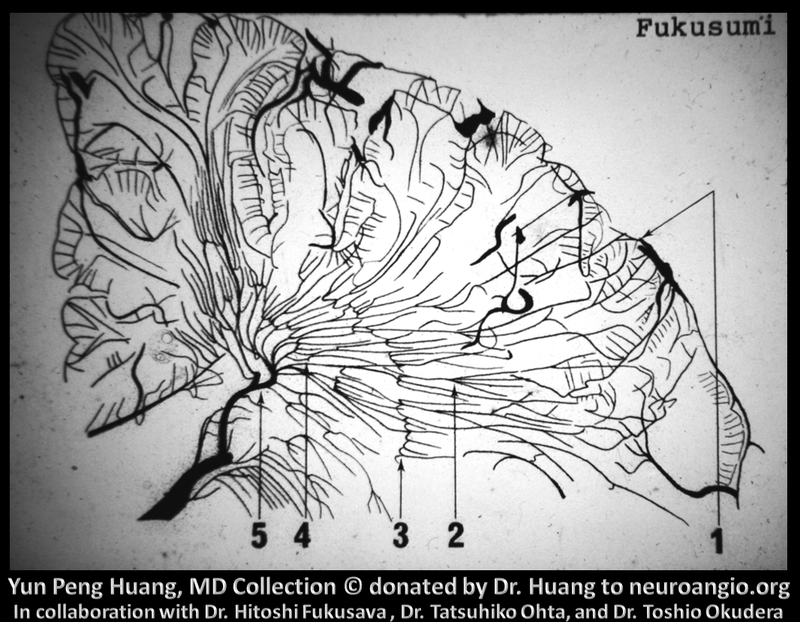 Huang, with its name reflecting the nature and location of the malformation. 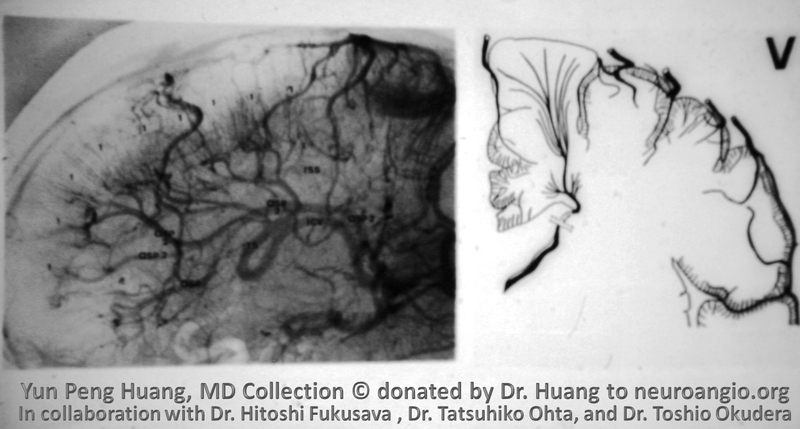 The term Developmental Venous Anomaly presumes existence of some form of intrauterine event, resulting in anomalous development – one proposition was microthrombosis of either deep or superficial venous apparatus, requiring the other one to assume control of the at-risk territory. This intriguing hypothesis has not been proven. In the following image, the numbers correspond to those of the preceding slide. 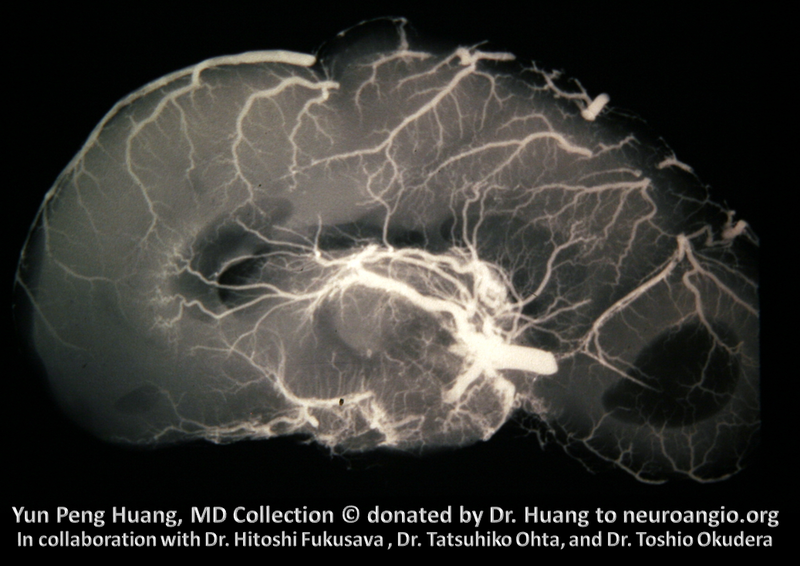 In this picture, DM = deep medullary veins, SM = superficial medullary veins. 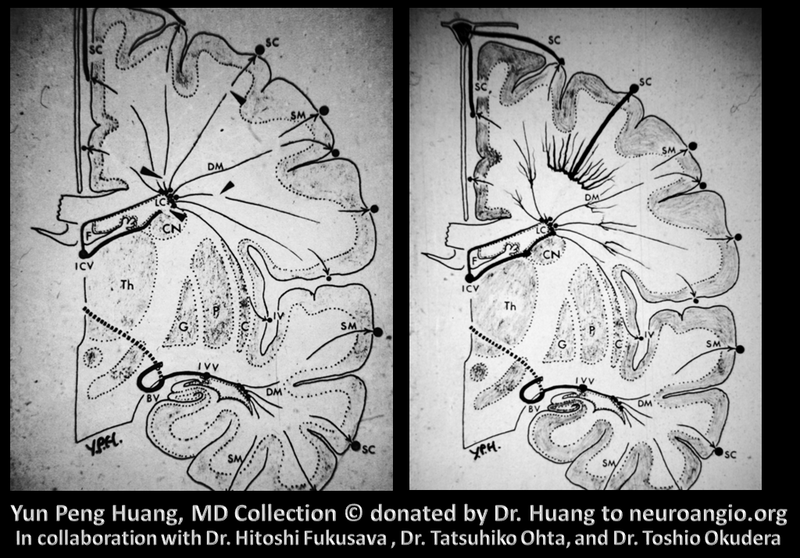 SC probably refers to surface cortical. 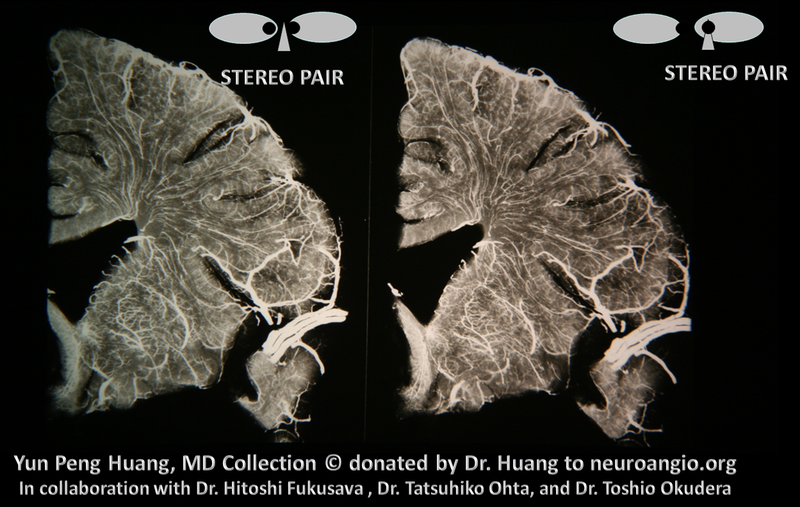 A beautiful stereo image. 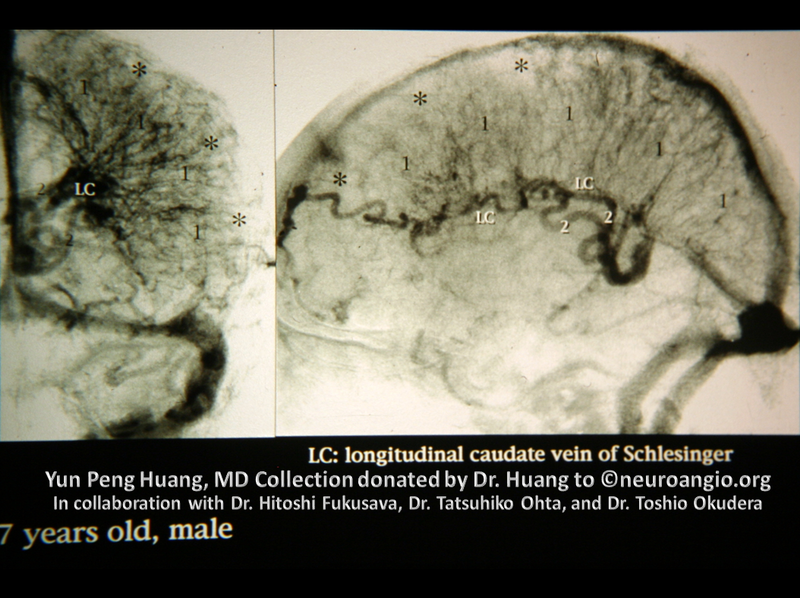 Notice how a few veins traverse the entire white distance between the pial and ependymal surface – the transmedullary veins. 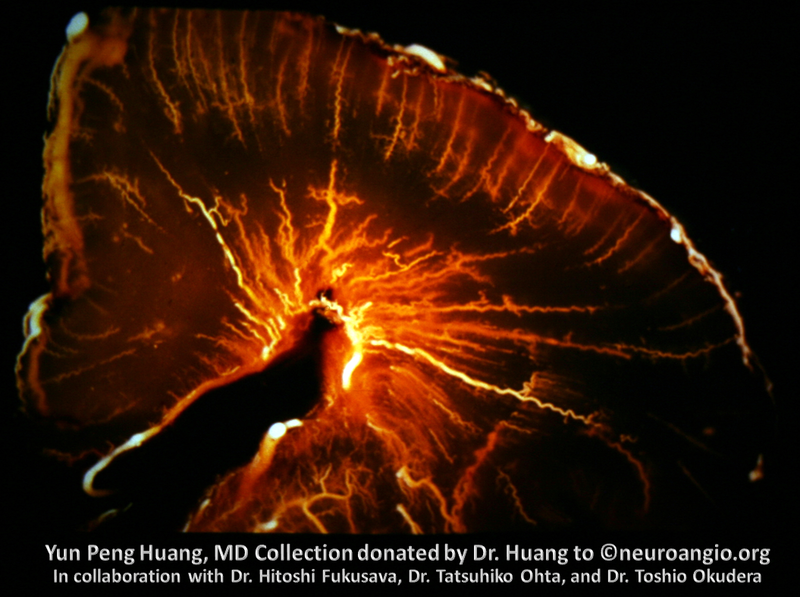 A momentary jump into the present — look at his amazing 7T MRI image of one of our own NYU very bright neurointerventional fellow, made by Dr. Raz. 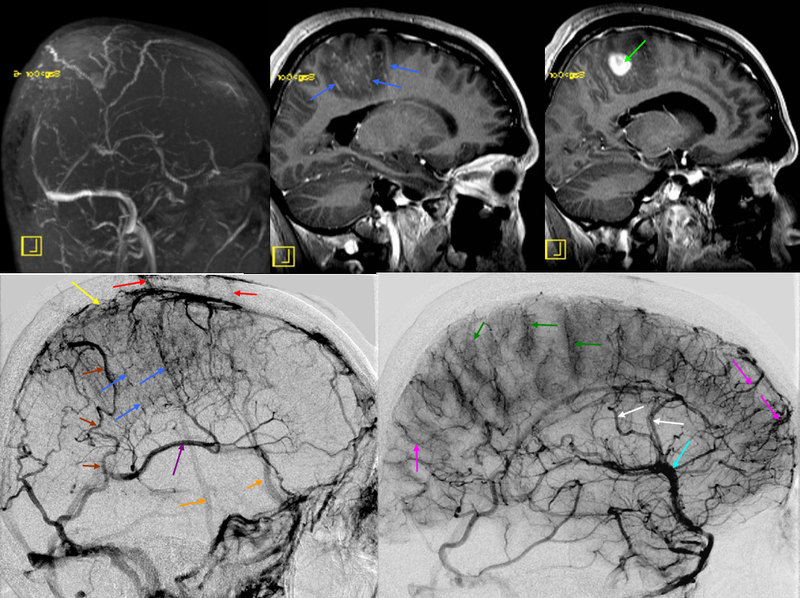 All veins — pial, superficial medullary, deep medullary (arrow), subependymal, ependymal, transmedullary — are seen here. We get the info, fellow keeps the brain — everyone wins. 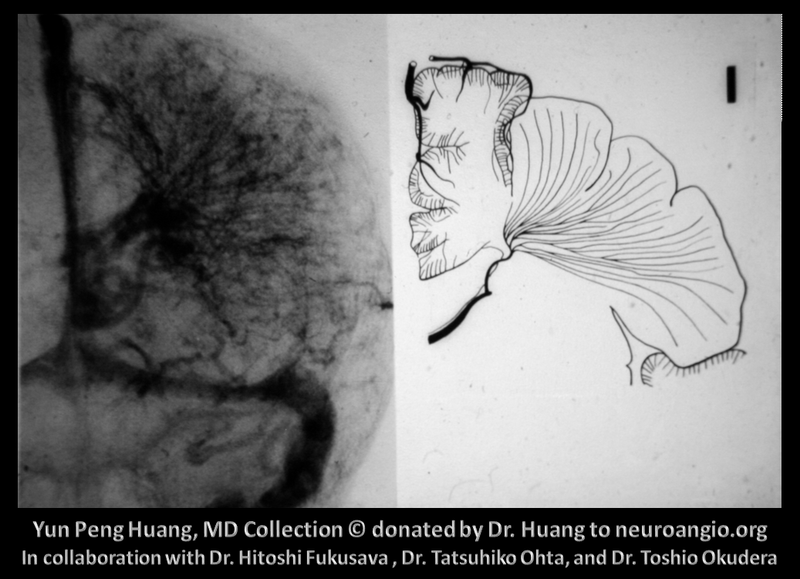 Back to Dr. Huang’s collection — beautiful depiction of the superficial venous collectors. 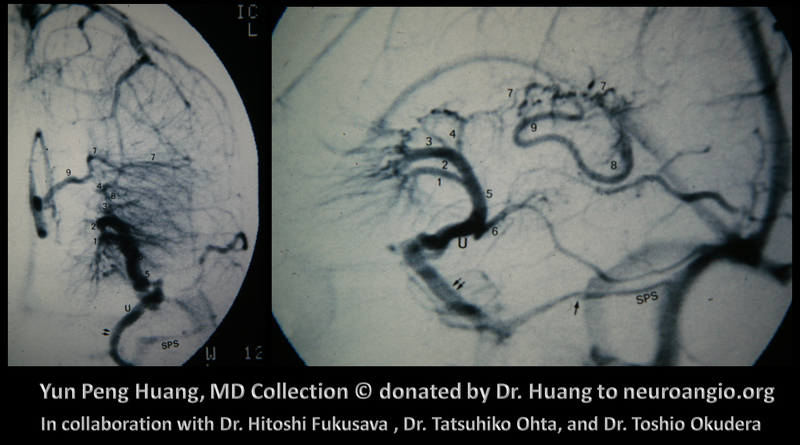 Imagine what might one of these look like of the adjacent ones were absent – the remaining vein vertically-oriented vein would likely collect a larger territory o longitudinally-oriented tributaries — isn’t that what a DVA looks like. 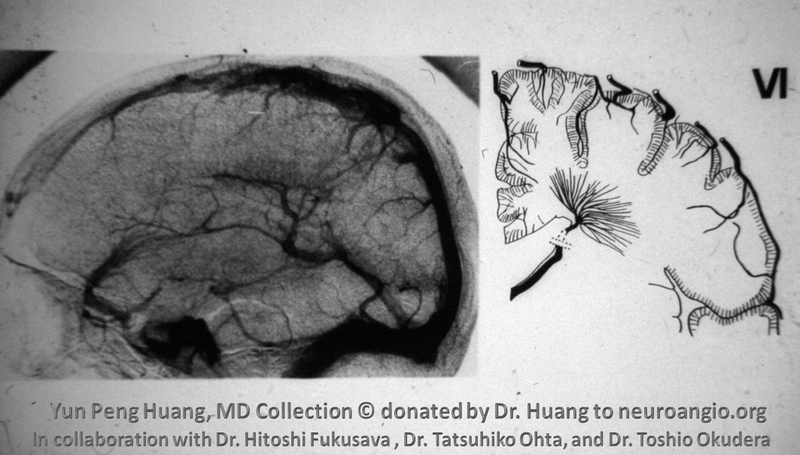 The concept of a Medullary Venous Malformation, or DVA, as a vein collecting more than its physiologic share of medullary territory now emerges. 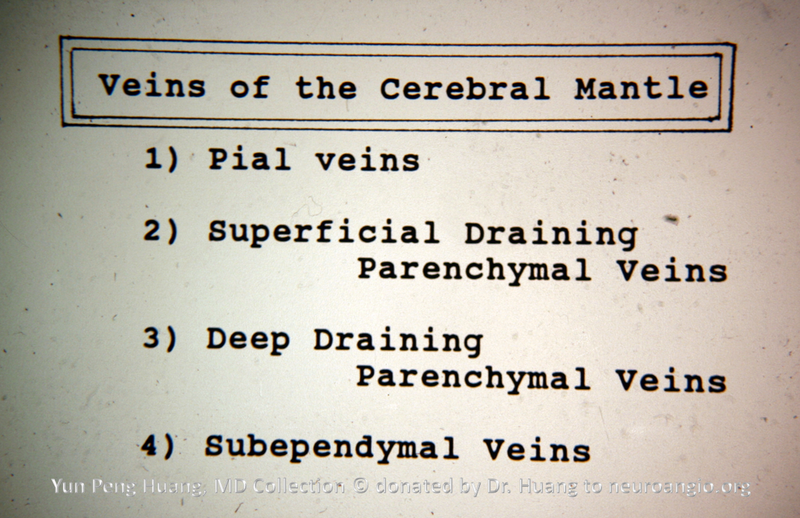 There are two types of DVAs depending on where the vein drains – superficial (I, II in the slide below) and deep (III, IV, V in the slide below). 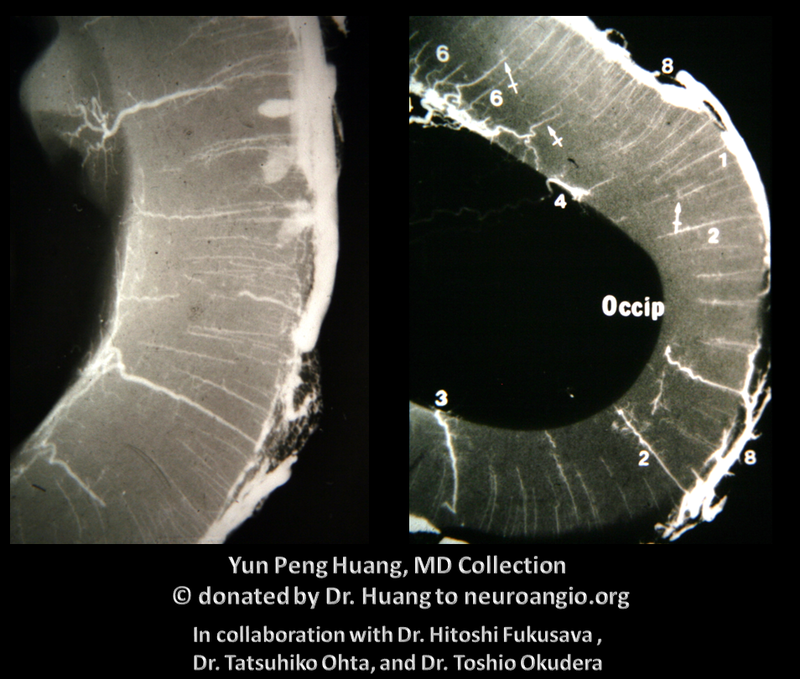 The majority drain superficially, assuming responsibility for drainage of the deep medullary territory which normally into the deep,subependymal system. 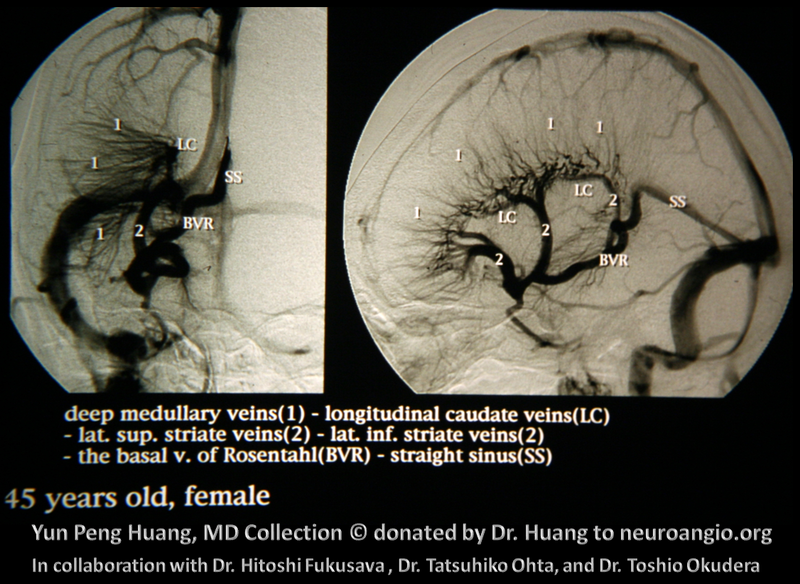 Deep MVMs, or DVAs, collect tributaries of the superficial medullary area which normally would be served by the pial veins. This idea is illustrated in the slide below, although the Roman numerical nomenclature of the different subtypes is no longer in use. 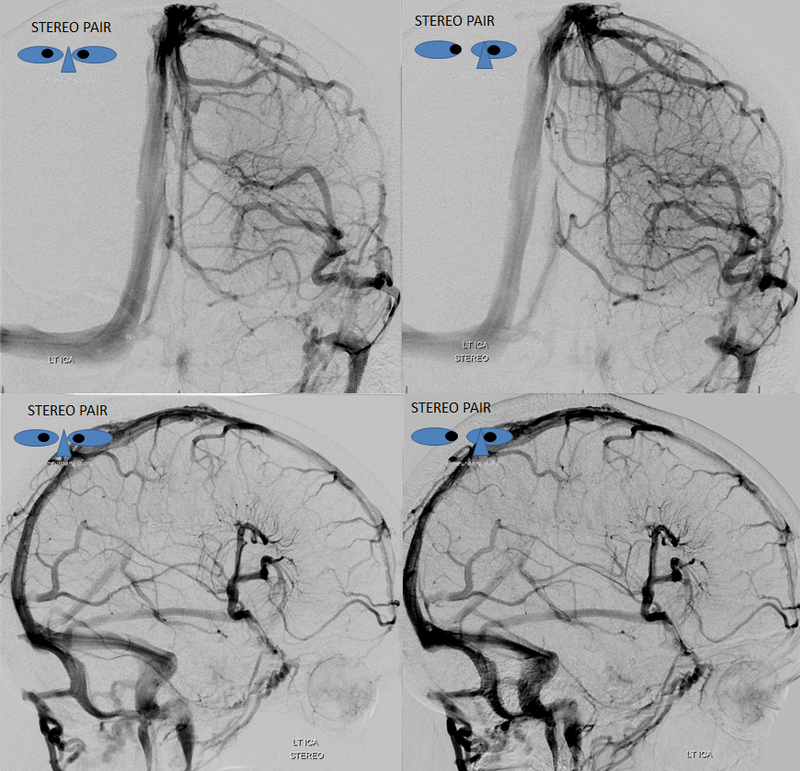 Extensive deep venous MVM — is this Sturge Weber? 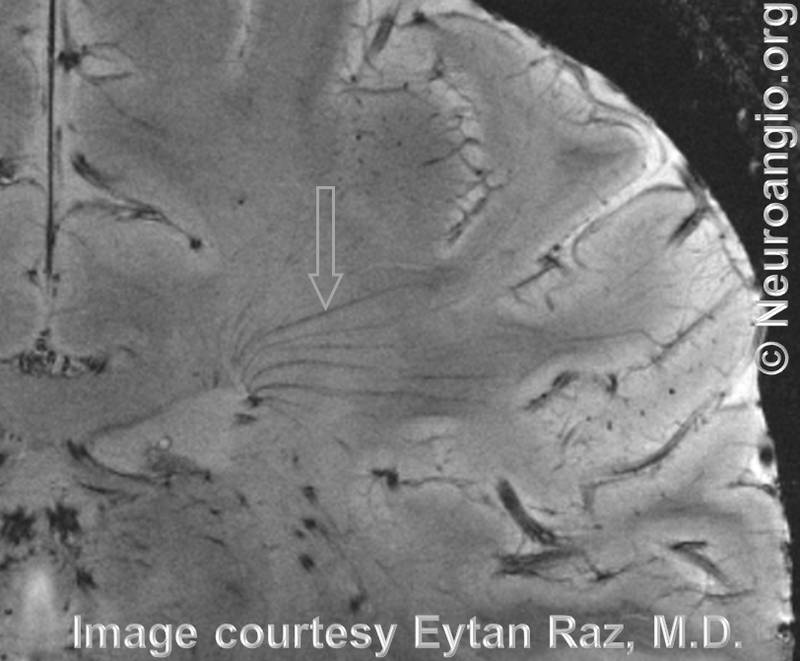 Cerebellar DVA with trans-pontomesencephalic drainage, highlighting presence of trans-medullary veins in the brainstem; similar transmedullary veins can be seen in the spinal cord. 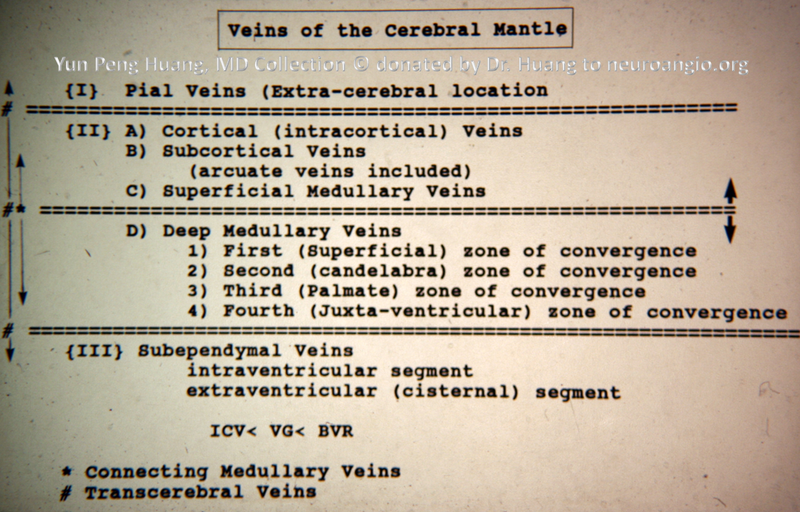 Essentially the entire internal cerebral venous system is collected into the basal vein, a unique structure which bridges the deep and superficial venous systems. 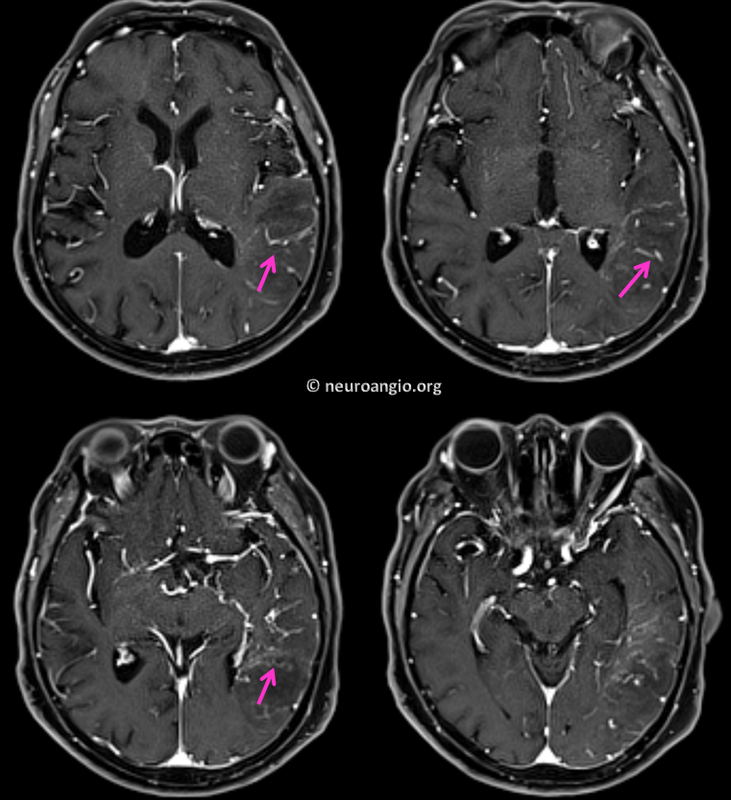 Cavernous Angioma/Cavernoma: The association between DVA and cavernous angioma or cavernoma is well-known. 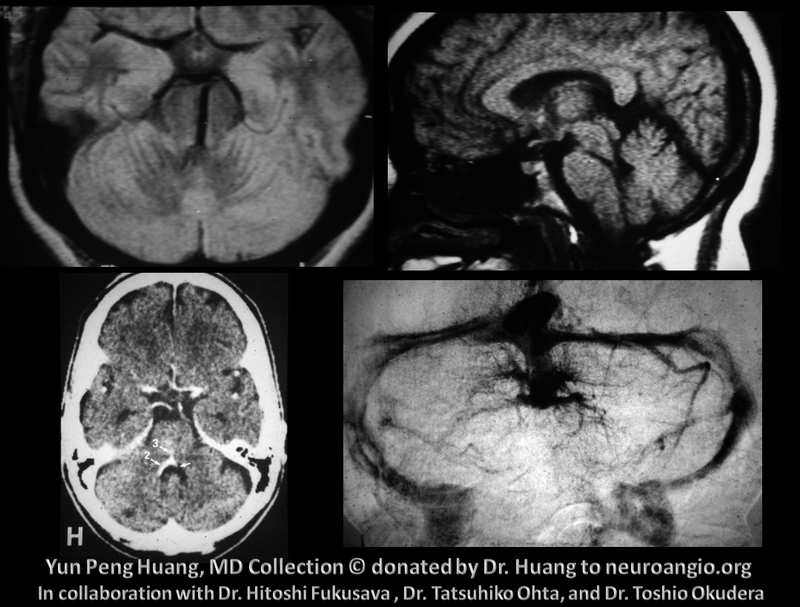 The vast majority of hemorrhages in the neighborhood of a DVA actually come from an adjaent cavernous angioma. 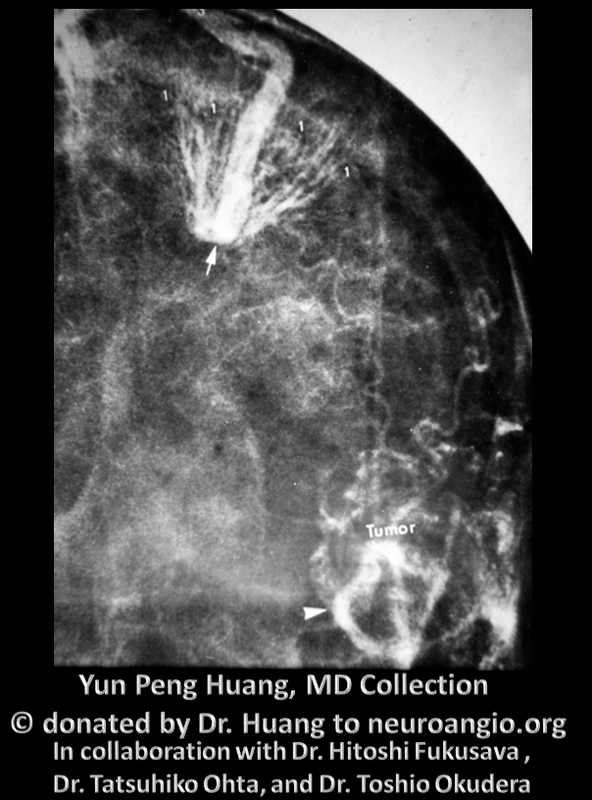 Why DVAs are associated with cavernous angiomas is not clear. 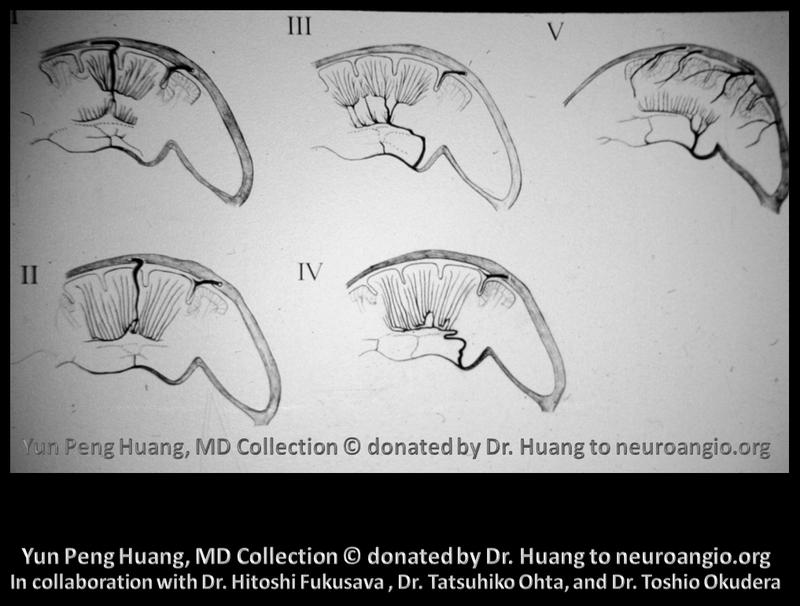 In large part due to worldwide adoption of the term DVA, Dr. Huang’s seminal contributions to our current understanding of normal and variant / anomalous / malformative venous drainage are not widely known to the current generation of trainees — an omission which neuroangio.org would like to see at least somewhat redressed.